Free download CDex latest version. Download CDex new version from the direct download link. 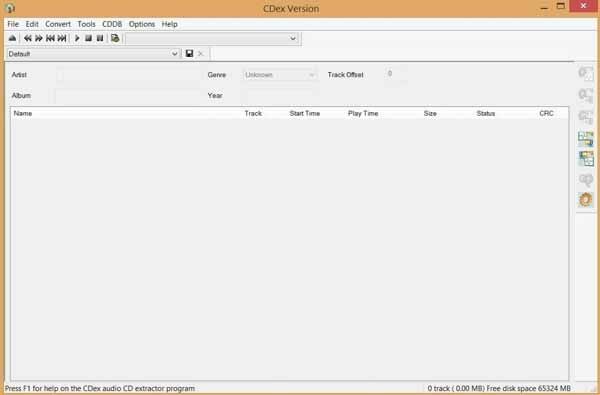 CDex is a free application software that is used to extract digital audio from audio CD. It is also called a CD ripper and used to convert different audio formats for your Windows. CDex is developed and maintained by Georgy Berdyshev and the source code was originally written by Albert L. Faber. CDex is very easy to download and install on your computer. As it is freeware so you can use it free and download it from the given download link below. It is light weight and easy to install. After downloading, simply run the setup file and the installation process will complete within seconds. After installation, you are ready to use it to extract audio files from any Audio CD. Using CDex, you can record multiple tracks directly, read/store album information to or from cdplayer.ini file. It also support CD-Text if your CD drive support this. It provides advanced jitter correction based on the cd-paranoia ripping library. During the operation, it indicates track progress and jitter control. CDex has the feature of normalization of audio signal and supports many CD-Drive from many manufactures. CDex can easily convert external WAV files and also support for M3U and PLS play list files. The best thing for CDex is that it is open source with the availability of source code. CDex support various languages. You can use this application on any computer having Windows XP, Vista, Windows 7, 8 or 8.1.